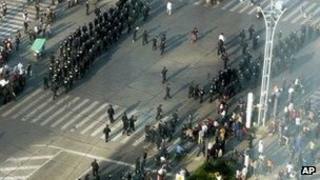 Riot police in eastern China have dispersed protesters opposed to the expansion of a petrochemical plant. Officials said crowds attacked police and overturned cars in the city of Ningbo on Friday night after a week of protests against pollution. Protesters tried to gather again on Saturday but were prevented. Environmental protests have become more common in China. They come ahead of a once-in-a-decade change of national leaders in Beijing. On Saturday, police dispersed more than 1,000 protesters in Ningbo. Witnesses described scuffles and a few people being arrested over the protest against the expansion of the plant by a subsidiary of the China Petroleum and Chemical Corporation. The Zhenhai district government in Ningbo city said in a statement that "a few" people had disrupted traffic by staging sit-ins. Zhenhai police accused protesters of throwing stones and bricks at officers. Residents, however, said the violence came after police used tear gas and arrested demonstrators. "I think the chemical and industrial project is not very good for the eco-system. I don't think they should exchange our living environment for development," protester Peng Shaoming told Reuters news agency. The Zhenhai district government statement said the proposed expansion was under review.